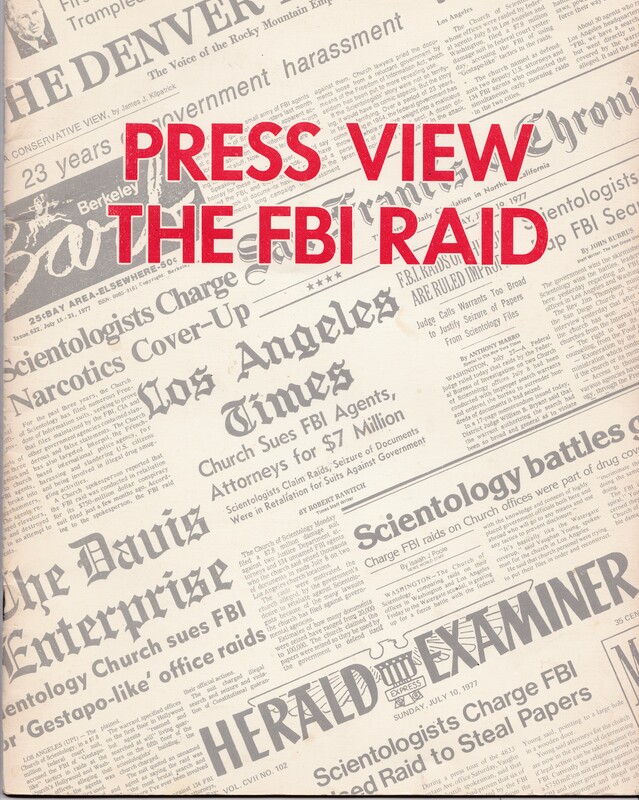 In “Press View the FBI Raid” Scientology’s case leaned heavily on claims of religious persecution. Since it was not associated with religion at that time, it went over the top in order to present that image. 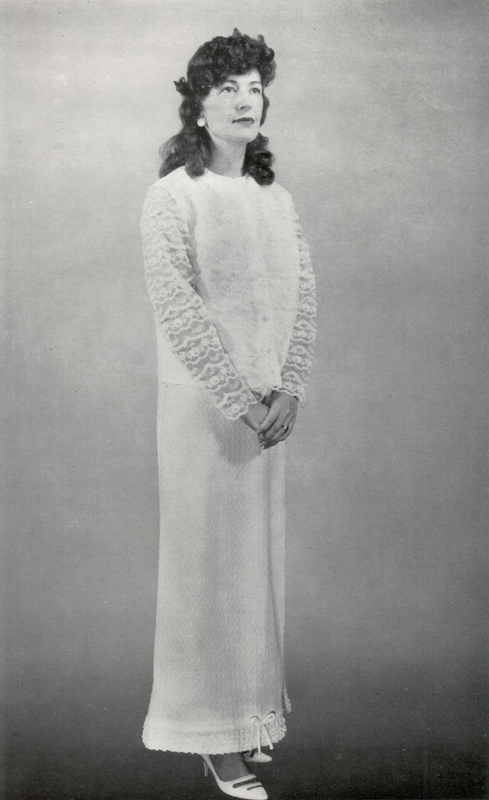 The publication includes this full page photographs featuring a Scientologist wearing an exaggerated version of Christian Clerical garb. he sported a dog collar, a huge (8-pointed) cross and carried a book (emblazoned with the same cross, just in case there was any doubt) in the same way that clerics will carry a copy of the bible. Just how crude the presentation was, is shown in the picture below. Yes. The chap in the clerical garb is a Scientologist. Other photos tried to present the FBI agents as brutal. However, the best that Scientology could come up with was pictures of Agents carrying boxes, one of a broken lock on an internal door, and an unsupported accusation that a Scientologist was hit on the head by a clipboard carried by an agent. The rest of this 31 page publication features reproductions of favourable press coverage and quotations (often taken completely out of context). For a more straightforward account of the raid we can turn to a Washington Post article which clearly laid out the facts. Interestingly,the Washington Post article included statements from “The Rev. Vaughn Young, a Scientology official in Los Angeles” and the “Rev. Hugh Wilhere, Scientology spokesman in D.C.”. Suddenly everyone was a “Reverend”, having taken a ‘chaplain’s course’ that could be completed in a few days. “The Rev. Vaughn Young” was almost certainly Robert Vaughn Young, a Scientologist who worked for some time as Hubbard’s literary agent. He became the national spokesman for Scientology fielding questions about the raid immediately after the event, and for months to come. Ironically Vaughn Young was entrusted with archive material in order to write Hubbard’s official biography. He concluded that the man had lied extensively about his life. Vaughn Young then defected, taking a lot of the documents with him, and them leaking them. This led to the first accurate accounts of Hubbard’s mythologised life, and dealt a terrible blow to the founder’s reputation. Hugh Wilhere seems to have remained a Scientologist, although the power he once held has been subsumed by the new ‘leader’ of the Church of Scientology, David Miscavige. He is a token executive, possessed of limited personal freedom. Despite propaganda like today’s document, many senior Scientologists were arrested. Hubbard was named as a co-conspirator and went into self-imposed exile, from which he never emerged. Hubbards wife, Mary Sue Hubbard, ran the Guardian’s Office, and organised Snow White on his direct orders She went to jail. Hubbard allowed her to take the fall for him. When Dianetics was first introduced to the world in the pages of the May 1950 edition of “Astounding Science Fiction” it was as a “new Science”. If you read the original article here, you will find that this was Hubbard’s pitch from the beginning. There was no suggestion whatsoever of a religious side to his creation. He explicitly states this on a number of occasions. This passage only exists in pre-1971 editions. It was removed from all later printings. Scientology is a branch of psychology which treats of human ability. That’s an odd observation, considering how hostile Hubbard was to psychology ever since academic psychologists panned his first book “Dianetics”. Perhaps he still needed to piggy-back on psychology’s respectability. The term Scientology is taken from the Latin word scio (knowing in the fullest sense of the word) and logos (study of). “Scientology, used by the untrained and the trained person, improves the health, intelligence, ability, behavior, skill and appearance of people. It is a precise and exact science, designed for an age of exact sciences. Science then (and an exact science too). Not a religion. In a 1953 letter to a colleague (reproduced in full below) Hubbard has already tired of the drawbacks of being expected to provide objective evidence for his unsupportable claims. He was considering transforming his creation into a religion. This would transform his ‘theories’ into religious doctrines protected by the first amendment, and provide tax exemption. Subsequently, a policy document that was once only available to executive members of the Church of Scientology, made it perfectly plain that that the presentation of Scientology as a religion was just a front – a pretence that has since been characterised as ‘religious cloaking’. Scientology 1970 is being planned on a religious organization basis throughout the world. This will not upset in any way the usual activities of any organization. It is entirely a matter for accountants and solicitors*. *Hubbard was running Scientology from Saint Hill Manor in England at the time. Here, a solicitor is a lawyer who gives advice, but does not represent you in court (which is typically the job of a barrister). So it has remained to this day. « Why Is A ‘Clever’ Magazine Like The “New Statesman So Dumb When It Comes to Scientology? ironically, this was just about the time that I “joined” this cult!!! I had met the “wasband” (my ex husband) around April of 1977…..married and stayed with him for 27 years. The I was declared SP. So he left me.